Someone recently made a post on MMO-Champion asking whether a specific ability counted as “Active Mitigation” and he received a lot of misinformation. Apparently, many players have an outdated understanding of the term, and to make things worse, the most recently updated Wikis on the topic are 3-4 years old. Yikes! Since I’m so annoying such a helpful guy, I will clear things up. Many players use the term “active mitigation” to refer to any move a Tank has that can be activated to reduce incoming damage. Sounds simple enough, right? Well, sort of — the term “Active Mitigation” actually means something different than “active mitigation”. What is “Active Mitigation” in Legion? 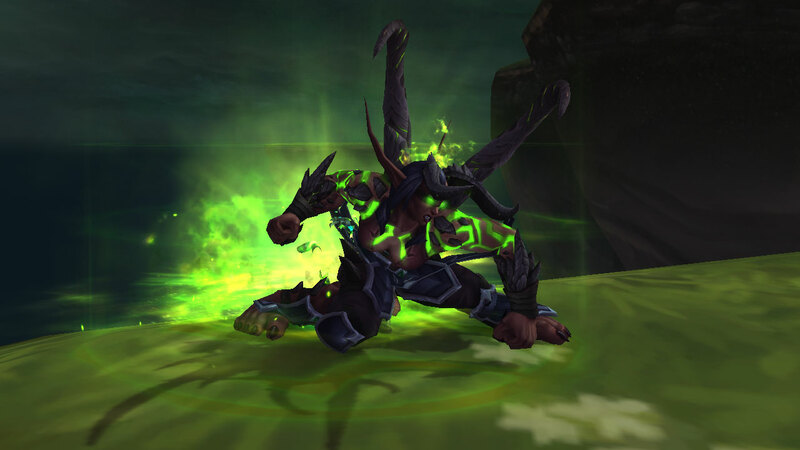 In Legion, the term “Active Mitigation” refers to a single, specific ability that a Tank must use as a counter to specific Boss abilities. These Boss abilities are designated as “Mitigation Checks”. The second Boss in Black Rook Hold has “Vengeful Shear”; if she lands it on you and you don’t actively mitigate it, you get a stacking debuff that makes you take extra damage. The last Boss in Neltharion’s Lair has “Molten Crash”; if you fail to actively mitigate it, you fly far, far away when he hits you. God King Skovald in the Halls of Valor has “Savage Blade”; If you fail to actively mitigate it, you take a bleed over time. The first Boss in Vault of the Wardens has “Dark Strikes”; if you fail to actively mitigate it, the boss gets a damage absorb shield. Your designated “Active Mitigation” ability can be checked in the Dungeon Journal (as long as your character is a Tank spec). Every Tank in Legion has only one ability that counts as “Active Mitigation” against Mitigation Checks. Yes, there are other “active abilities” that “mitigate” but they are not considered “Active Mitigation” as they do not counter Mitigation Checks. For Warriors, their Active Mitigation is “Shield Block”, while “Ignore Pain” is not Active Mitigation and does NOT count for Mitigation Checks. 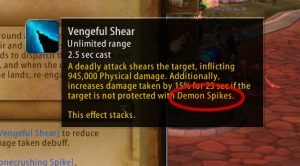 For Demon Hunters, their Active Mitigation ability is “Demon Spikes”, while “Fiery Brand” is not Active Mitigation and does NOT count for Mitigation Checks. So basically, all of this confusion is just because the term “active mitigation” was previously used as a blanket term to cover any ability that could be used to reduce damage, whereas now “Active Mitigation” is used to specifically refer to a single ability that satisfies a mitigation check. Maybe it might have been more clear if the developers called the current “Active Mitigation” something else, like a “Mitigation Counter” ability?